The Black Keys will release their new album El Camino Tues. Dec. 6, having already released the first single from the record "Lonely Boy" and today announced the first run of tour dates in support of the new album. They'll kick the tour off in Cincinnati in March and play mostly through the upper midwest and points eastward. They have a couple shows in Eastern Canada, as well. You have to expect they'll release more dates soon, heading west and south. I'm feeling good about them playing in their newly adopted home of Nashville, and I should finally get to see them (assuming Tom Petty doesn't have a show the same night that goes on sale first). The band has been riding a white-hot wave of hype and success, rising from obscurity as a 2-man show from Akron, OH to a Grammy-winning, critically acclaimed band with serious commercial appeal. 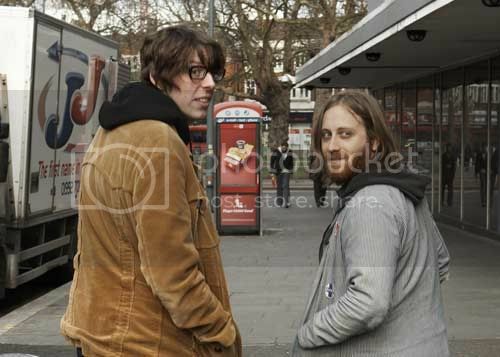 Is it time for The Black Keys Backlash? I like "Lonely Boy" and have my copy of El Camino is pre-ordered. I like the early, lo-fi records as well as the more elaborate sound of Attack & Release and Brothers. I just have this feeling the cool kids are about ready to dump on them and I'm curious to see if A) that happens and B) if there is justification for it. Will they deuce all over a good record just because too many other kids are buying it or will the Keys slip up at a time when the knives are out? If you can't wait, you can head to their web site and stream five songs from the upcoming record. I'm waiting... impatiently. Here are the first dates for the Black Keys' upcoming tour.